Scenic Lake Tahoe is a majestic alpine lake that is surrounded by the towering peaks of both the Sierra Nevada to the west, and Carson Ranges to the east. Lake Tahoe shares the common border of California and Nevada and is known for its incredibly, clear water. The lake is one of the largest and deepest lakes in the world. It ranks as the second deepest in the U.S., behind only Crater Lake in Oregon. One of the best ways to enjoy Lake Tahoe is by boat. Departing from Zephyr Cove on the southeastern corner of the lake, the M.S. Dixie II is a 520 passenger, award-winning boat and has been voted “Best Cruise in Nevada” by Nevada Magazine. The M.S. Dixie II is a paddle wheeeler boat and the largest cruising vessel in South Lake Tahoe. The boat has three passenger decks. The top deck is called the Hurricane deck, where you can enjoy incredible lake views and clean, alpine air. There’s also a snack bar to purchase food and drinks during your tour. The second deck includes an entertainment area and gift shop to buy souvenirs. The bottom or main deck has a large dining room for a sit down meal or a refreshing cocktail. On several wall mounted TV’s, watch a biography about the history of Lake Tahoe, learn how the lake was created and its numerous changes over the years. The sightseeing cruise lasts between 2 and 2.5 hours. Passengers will be treated to stunning views of Mother nature at her very best. From the towering Sierra Nevada Mountains that surround Lake Tahoe, to entering beautiful Emerald Bay. The M.S. Dixie II boat departs each day from Zephyr Cove Resort. You can chose from a Breakfast or Champagne Brunch cruise, a midday Emerald Bay sightseeing cruise with lunch or try the popular Sunset Dinner Dance cruise for a truly, romantic experience. During your boat cruise, there will be nonstop photo opportunities. The lake is a beautiful blue color and complimented by the contrast from the surrounding Sierra Mountains. Depending on the time of year, the mountains are often covered in snow. After traveling west across the lake, we slow down upon nearing scenic Emerald Bay, which in 1969 became a National Natural Landmark. The bay located in the southwest corner of Lake Tahoe. The boat then enters via a narrow opening and everyone is in awe of the natural beauty that engulfs us. A narration over the ship’s speakers explain how the granite surfaces were carved and formed by glaciers. Soon, Fannette Island comes into view, literally rising right out of lake’s waters. It’s the only island on Lake Tahoe but has a famous past. Mrs. Lora J. Knight of Santa Barbara purchased the land near the island in 1928 and named it Fannette Island. You can see on the summit the remains of a small, stone building – named The Tea House. On the shore, we get an up close view of magical Vikingsholm mansion. This 38 room castle was built by Knight and finished in 1929. The stone mansion has a Scandinavian look as it sits just beyond a sandy beach with waves lapping up on the shore. She lived in the home until her death in 1945. 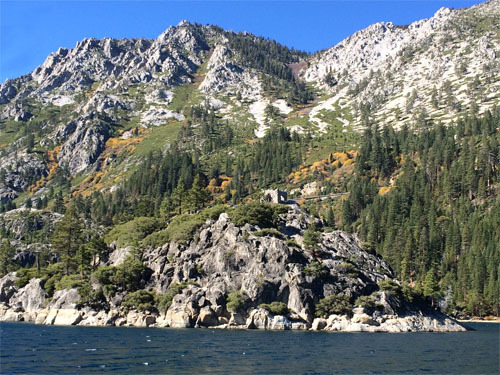 Vikingsholm can also be reached by hiking or walking along the scenic trail, down to Emerald Bay. As we circle around the back side of Fannette Island, one can simply admire and appreciate the area’s natural beauty. We slowly exit Emerald Bay and return to the open waters of Lake Tahoe. As you gaze to the south, you’ll notice the ski runs of Heavenly Mountain Resort and the towering, hotel casinos of world famous South Lake Tahoe. The original M.S. Dixie boat began service on Lake Tahoe back in 1949. Operating first as a pleasure boat, it was expanded and became the inaugural paddle wheeler, serving the public in 1972. Then in 1994, the current M.S. Dixie II went into service bring modern technology that has served many thousands of passengers ever since. Taking a boat cruise on the M.S. Dixie II is one of the most affordable and rewarding water activities to do while visiting Lake Tahoe. It’s an incredible VIP experience that should not be missed. If you are interested in traveling to Lake Tahoe and enjoying this wonder of nature high in the Sierra Mountains, contact The Life of Luxury. When visiting, be sure to plan a boat cruise on the M.S. Dixie II. Return soon to follow our luxury blog and read about other luxury travel destinations.